Two days ago, thirteen women - including a Nobel Peace Prize winner - on a peaceful mission to break the illegal blockade on Gaza were abducted in international waters and detained in an Israeli prison. Vyara Gylsen reports. 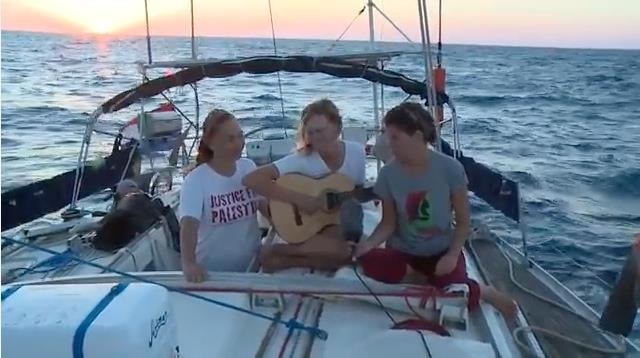 Thirteen women were detained in an Israeli prison after being abducted from international waters while on a peaceful mission to break the illegal blockade on Gaza. Among the women were Nobel Peace Laureate Mairead Maguire, former US army colonel and diplomat Ann Wright and New Zealand MP Marama Davidson. The women who were on board the Zaytouna-Oliva of the Women’s Boat to Gaza have issued SOS messages urging the international community to help them. At 15:58 (CEST) on 5 October, we lost contact with the Zaytouna-Oliva, when it was just 40 nautical miles off the shores of Gaza. As our concern grew for the safety of our team, we also received the news that Gaza was under Israeli bombardment; the latest in a string of increasing breaches of the ceasefire agreed in August 2014 following Israel’s bloodiest offensive against the enclave to date. Israel sent female officers to surround and board the boat – as if having women to kidnap other women will somehow make them appear less oppressive. They then claimed to be “escorting” the women on the boat to Ashdod – an interesting choice of words considering they seized and confiscated the boat, captured the women against their will and then took them to Israel by force. This act of state piracy was committed in international waters, making it completely illegal. They then proceeded to imprison the women at Giveon in Central Israel. Earlier on Friday (7th October) we received reports that the detainees were being deported. Launched on International Women’s Day, the Women’s Boat to Gaza also aimed to raise awareness of the role of Palestinian women in peaceful resistance and the survival of the Palestinian people as a whole. 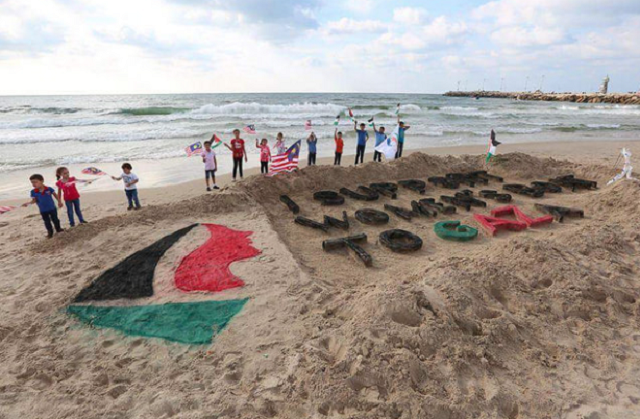 Women joined forces from all over the world for this peaceful mission to break the illegal blockade on Gaza and raise awareness of the suffering that Palestinians are increasingly forced to endure. Women are in effect taking the full brunt of the Israeli blockade and relentless wars on Gaza. Israel has besieged Gaza by land, air and sea since 2007, effectively imprisoning 1.8 million Palestinians. Gaza, one of the most densely populated places on the earth, has suffered three deadly assaults for which Israel is being investigated for war crimes by the International Criminal Court. The blockade restricts the movement of goods and people, while Palestinians struggle to acccess even the most basic forms of human rights and services, such as food, water, electricity, medicine, shelter, schools and hospitals. This blockade is in contravention to International Humanitarian Law, including the Geneva Conventions, which prohibit collective punishment. As a result, Gaza is increasingly reported to be experiencing an environmental, humanitarian and economic crisis that the UN predicts will make Gaza uninhabitable by 2020. The United Nations Relief and Works Agency (UNRWA) reported that 80 percent of Gaza’s Palestinians “depend on humanitarian assistance to meet their basic needs.” Over 90 percent of water in Gaza is unfit for human consumption and electricity is limited to a few hours a day with daily black outs lasting 12-16 hours. Bombed on their left and reaching out for help on the right, yesterday was a microcosm of the Palestinian plight. Palestinians in Gaza regularly face Israeli aggression as well as impenetrable walls and restrictions, unable to find safety or a way out. Despite being abandoned by the world powers, they continue to show their formidable spirit of hope, resilience and survival against all odds. As the world is busy with the new of this year’s prize for the Nobel Peace award – awarded to Colombian President Juan Manuel Santos today – they turn a blind eye to 73-year-old Nobel Peace Laureate Mairead Maguire being unlawfully detained simply for taking part in a peaceful mission. Perhaps the Nobel Peace Prize is not worth the gold it’s made of? It is exactly due to this failure by international governments to deal with the issue that civil society, across the globe, must act. While the women are being deported, 1.9 million Palestinians in Gaza remain under an illegal Israeli blockade. Countless initiatives around the world such as the Women’s Boat to Gaza and the Freedom Flotilla Coalition will continue to raise awareness of this fundamental breach of international law until our brothers and sisters in Gaza are free. Details of key contacts around the world can be found here. Vyara Gylsen is a London-based anti-war and anti-arms trade activist and campaigner, with a focus on anti-militarism and Palestinian rights. « Previous: Special Report | Does the Prevent strategy have any credibility left? What about the human rights of Jews not to have rockets shot at their houses or have their children blown up in pizzerias and discotheques? There are five-star hotels and malls full of luxury goods in Gaza. The only humanitarian crisis there is the one created by the racist fascists in Hamas, who just won’t leave Israel alone.